Guatapé, Colombia is one of the most beautiful, serene, appreciated and well-known areas of central Colombia. Only one hour from the well-known and vibrant cultural center of Medellín, it has an altitude of 2000m and a year-round consistent climate ranging from 60F to 75F. This area of Colombia is very rich in fruits and vegetables and characterized by a lush, green vegetation cover, with giant bamboo (guadua) and ever-present ochre, sienna and multi-colored clays used in the traditional construction methods known as bahareque, tapia and quincha. The Guatapé Reservoir provides electricity to this 2nd largest population center of Colombia and is also a source of fish, boating, swimming and tourism for the locals and foreign visitors. 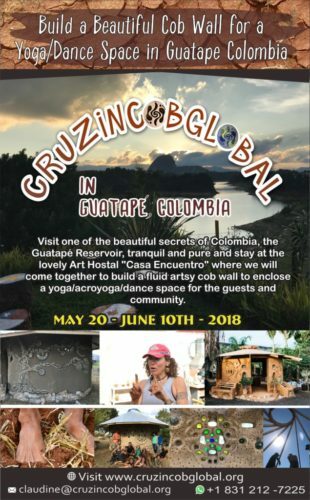 Guatapé has also recently become a significant center for travellers to get back into Nature after the hectic city life in Medellín and Bogotá. Several monasteries of different religions have established themselves here which makes one think that there must be something special about the energy drawing them here. There is a huge rock protruding vertically out of the Earth called “La Piedra del Peñol” which lives here. Most likely it has been a historical spiritual pilgrimage site for the indigenous people, a power center of sorts, which now is a must-see tourist attraction in every travel guide. It borders one edge of the large reservoir and from the workshop site location is a 2-hour walk on a quiet lovely country road. In my experience, it is one of those places on the Planet that you arrive in and end up staying longer than you’d planned. The workshop will be held at a Soulful Boutique Art Hostel I fell in love with at first sight. I was going for a walk to the Rock and happened upon the “Casa El Encuentro” hostel overlooking the quiet side of the Reservoir with majestic beauty. Immediately I knew the creator of this hostel must be someone ultra-cool. Bright clay colors, mosaics everywhere, tree stumps painted with flags, wine bottles painted with abstract designs, walls with bottle windows, wild paintings and gorgeous bamboo railings and verandas make this place very Soul and Spirit-nurturing. I knew I had to stay for a while and set up my tent all the way at the bottom of the slope in front of the water for 5 days, after which I was very clear on manifesting a workshop here. El Encuentro has an amazing and peaceful view of the reservoir and the surrounding mountains with the big rock out on the west where the sun sets. Students will share the main house on the property and the various bedrooms. In the case of more than 10 students there is more lodging in the dormitory and private rooms above the main house. The house is equipped with bathrooms and a kitchen as well as an outdoor hammock veranda with the million-dollar view for meditation and yoga and chilling. The workshop site will be just 50 feet from the house. Breakfast and Lunch will be served in the house and are included in the workshop price Monday through Friday. Weekends are off and only breakfast will be served and students are free to go travelling, hiking, boating, or into Medellín, a very happening city. For Dinner students will get to try out all the different eateries in Guatapé or make their own meal. Hosts are arranging a very economic dinner option at an excellent local restaurant for the group. The town is a short 10-15 minute walk from the Hostal. Our hosts are offering workshop students the first Welcome Dinner and last Celebration Dinner and a lavish final Breakfast as a thank you for leaving them with a unique gift they will cherish and use well. Students have the first two weekends off to explore the area, go to Medellín, relax in Guatapé, etc. There are so many things to do in the area ranging from hiking, rock climbing, mountain biking, waterfalls, hang gliding to meditating and volunteering at the various monasteries. There are various tour guides that will lead you on these adventures. This is a bilingual course offered in English and Spanish. Casa Encuentro opened its doors thanks to the artistic work of Maria Elena Silva (MAKANA), founder and designer of the project. Her passion for art and nature is a unique combination that creates a special space full of life and color. Suitable for the imagination! From her ever-exploring and restless soul in search of a dream place, MAKANA came to this beautiful place as a gift of fate. It was here where she finally found her connection with her artistic, creative soul, and rediscovered her essence with nature. As she walked that journey, another person came along. Since her childhood, where so many experiences have connected her to this environment and its being, a new chapter is added to this beautiful story when Naty Ramirez, daughter of MAKANA joins, with her creativity and universal vision, this ideal project. And that is how Casa Encuentro was born from a dream come true. Casa Encuentro is the ideal place for the traveling community of the world. It was born from the deep desire to enrich a sacred space that connects man with nature through relaxation practices, interaction with art, landscape and dining experiences. The workshop project is an 11-meter long curvaceous wall that will partially enclose (3/4) a space for yoga, acroyoga, meditation, dance, music, etc for guests and the community overlooking the reservoir. 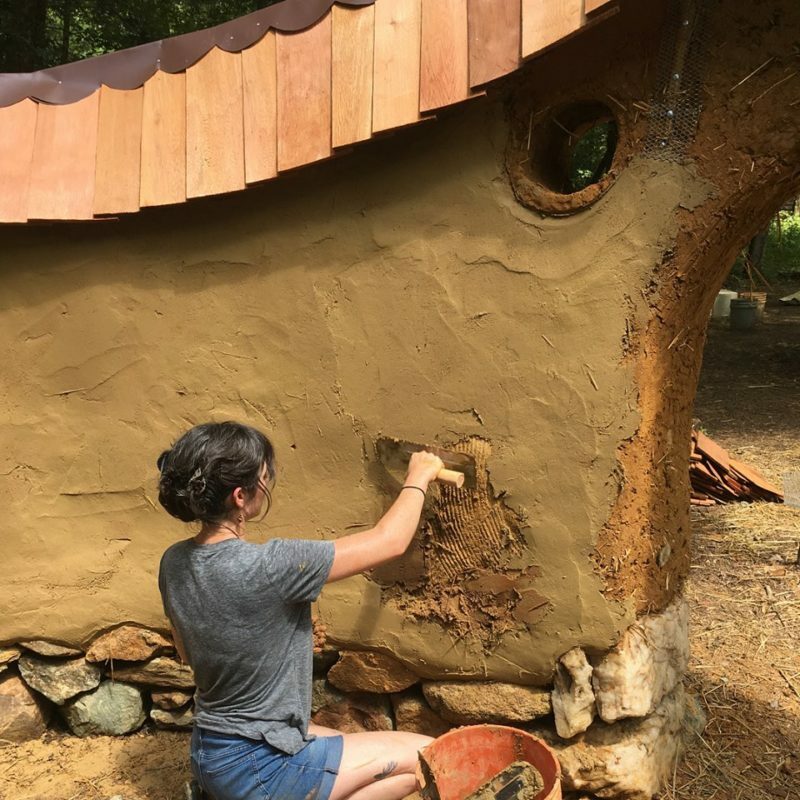 With the foundation built before the workshop, we will build the cob wall in the first two weeks including windows, a big arch passageway, bottles, sculptures, niches, shelves, arches, plaster and the roof connectors. We will also pour a partial floor (10m2) during the first week. In the last week we will build the roof and add another layer of plaster and floor. The 21-day Cob Building Workshop consists of 15 days of theoretical instruction (lectures with graphics) and construction for 4 hours in the morning and 3 hours in the afternoon. Students arrive on Sunday and the Course begins with Dinner. There are two weekends off for travelling, resting, and visiting the local area. Morning (4 hours) and afternoon (3 hours) sessions each have a 15-minute snack break. Lunch break lasts 1.5 hours which includes about 1 hour of rest time before the afternoon session begins, with a 30-60 minute lecture, followed by construction. After class there is a 90-minute break before dinner, which may include an optional yin yoga session. There will also be 4 evenings (twice a week) after dinner for showing slides, videos and having Course-related discussions. the first coat of earthen plaster on the wall. Time and weather-permitting we will apply the second coats of floor and wall. 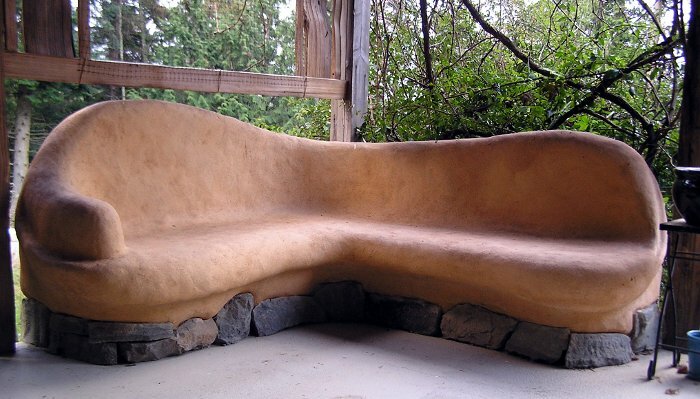 In some Courses we may offer tadelakt lime plaster finish on the outside or inside walls. Finally we will build the roof structure and, ideally, as much of the roof covering as possible (this depends on the number and ability of students and weather). 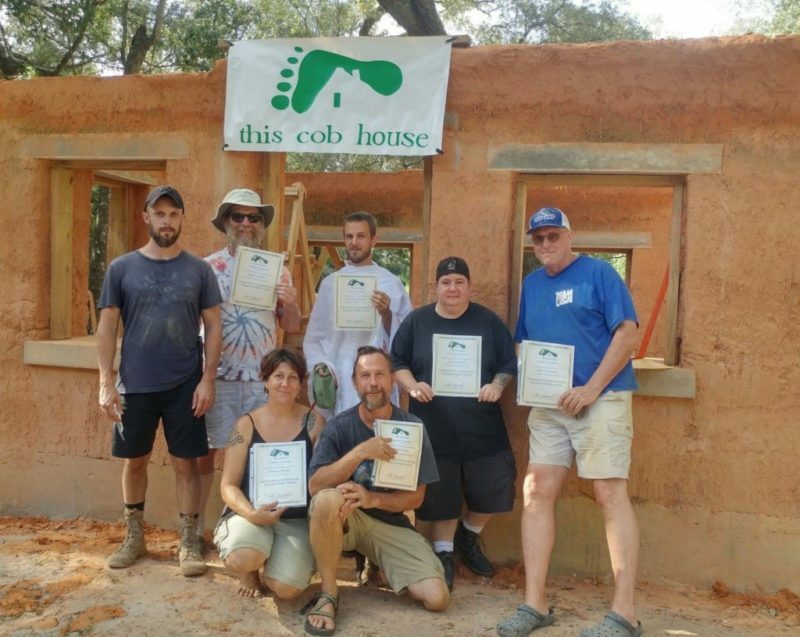 Those who complete the 21-day Workshop will receive an Intermediate Cob Building Certificate of Completion for Cob Walls (which includes Door, Windows, Shelves, Art, Electrical & Plumbing), Floor , Plaster & Roof.